While Miami, Florida, might not be a place where you naturally experience the cold-weather wonders of the winter holidays, residents certainly do everything they can to bring a little bit of Christmas to South Florida. Finding a living Christmas tree might be a bit difficult because there are certainly no pine trees native to this tropical region. However, Christmas trees are regularly shipped south from tree farms located in North Carolina and other climates more amenable to growing evergreens. While you won’t find a cut-your-own Christmas tree farm anywhere near Miami, many pop-up stands appear on corners and parking lots selling a variety of trees during the Christmas season. Most tree farms open on the Friday after Thanksgiving and stay open until Christmas Eve. They offer fresh North Carolina Fraser Fir trees of all sizes, along with poinsettias, wreaths, garlands, and other holiday greenery. You can even have your tree custom flocked in white at their Tamiami location, and if you bring your own tree stand, they will install and level it for you. Jack's also sells stands with a center spike, and their trees all have holes in the bottoms for easy use with those stands. They will load the netted tree into your car trunk or onto the roof of your vehicle and tie it down with free string. Bella's on Biscayne Blvd. 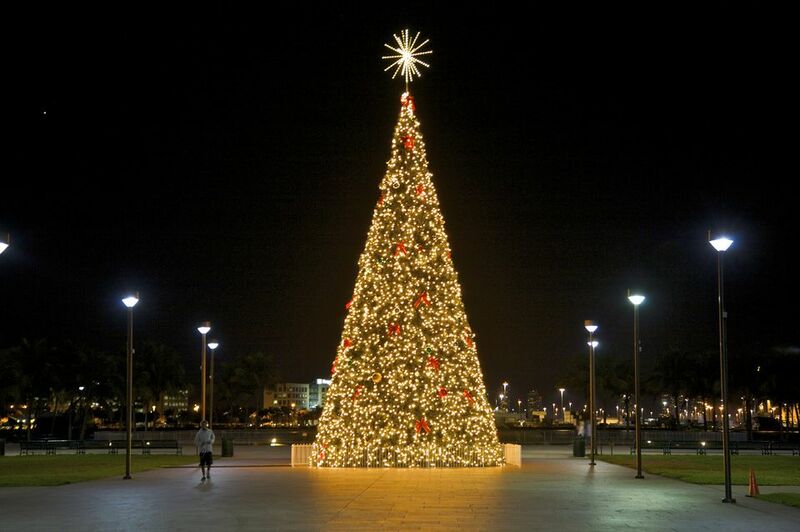 in North Miami Beach offers a large assortment of trees, wreaths, stands, and holiday plants. They sell Fraser FIrs because they are known to retain their needles longer and are durable in the hot Florida weather. Phone orders and delivery service are available. Holiday Sales has been selling Christmas trees at two locations in Miami for more than 65 years. They will flock your tree in your choice of color and can even add glitter for a great effect when the tree is lighted. For additional Christmas decorations, choose from a large selection of fresh-grown Poinsettias, live topiaries, and handmade wreaths. Firefighters Christmas Trees near the University of Miami is operated by the Coral Gables Firefighters Benevolent Association. They sell tabletop-to-12-foot-high Fraser Firs from North Carolina. In addition to fresh trees, they sell long-lasting Poinsettias, reusable sturdy tree stands, and handcrafted wreaths. Once you’re done with your tree, be sure to take advantage of the recycling program run by the Miami-Dade County waste collection service. Residents can take their trees to one of the county's Trash and Recycling Centers or to the West Miami-Dade Home Chemical Collection Center. Trees must be free of lights, stands, ornaments, tinsel, and other decorations. They will be converted into mulch, which will be available to residents beginning in February. Some residents outside city limits are able to leave their trees at the curb for pick up. Miami Rum Renaissance Festival, Miami Beach, Fla.
What Goes on at the Calle Ocho Festival in Miami?